This is the fifth edition of the Maternal, Newborn and Infant Clinical Outcome Review Programme’s report concerning maternal deaths and morbidity. The report includes surveillance data on women who died during or up to one year after pregnancy between 2014 and 2016 in the UK. In addition, it also includes Confidential Enquiries into the care of women who died between 2014 and 2016 in the UK and Ireland from mental health conditions, thrombosis and thromboembolism, malignancy and homicide, as well as morbidity Confidential Enquiries into the care of women with major obstetric haemorrhage. Surveillance information is included for 545 women who died during or up to one year after the end of pregnancy between 2014 and 2016. The care of 247 women who died and 34 with severe morbidity from major obstetric haemorrhage was reviewed in depth for the Confidential Enquiry chapters. 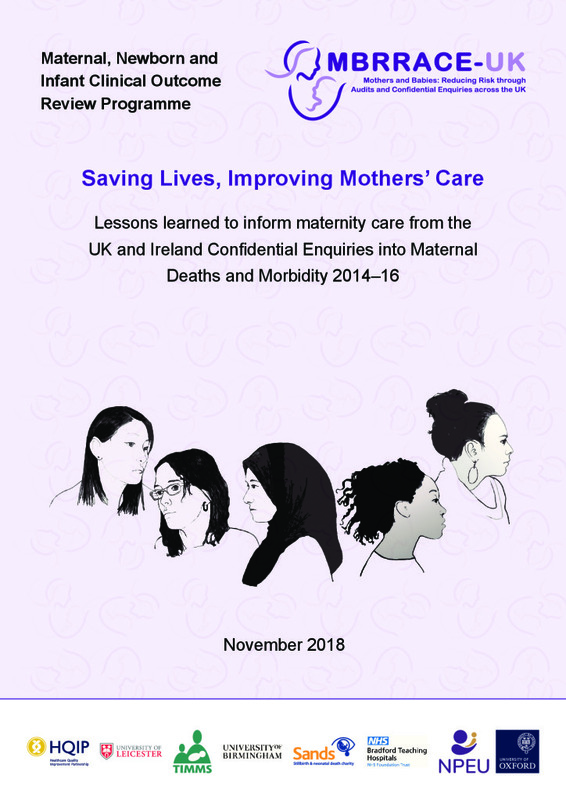 There was a statistically non-significant increase in the overall maternal death rate in the UK between 2011–13 and 2014-16, which suggests that implementation of the recommendations of these reports is needed to achieve a reduction in maternal deaths. Assessors judged that 28% of women who died and 12% of women surviving with major obstetric haemorrhage had good care. However, improvements in care may have made a difference to the outcome for 38% of women who died and 74% of women with major obstetric haemorrhage who survived. To download the full report click on the link below.